uBlock Origin (or uBlock₀) is not an ad blocker; it's a general-purpose blocker. 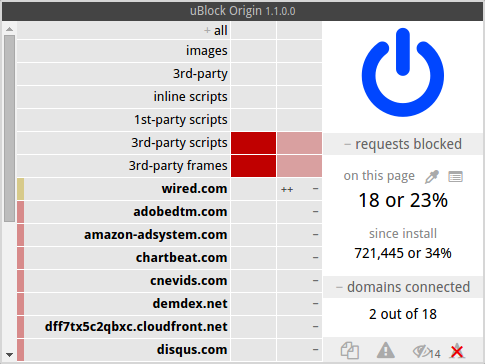 uBlock₀ blocks ads through its support of the Adblock Plus filter syntax. uBlock₀ extends the syntax and is designed to work with custom rules and filters. Furthermore, advanced mode allows uBlock₀ to work in default-deny mode, which mode will cause all 3rd-party network requests to be blocked by default, unless allowed by the user. Ads, "unintrusive" or not, are just the visible portions of privacy-invading apparatus entering your browser when you visit most sites nowadays. uBlock₀'s main goal is to help users neutralize such privacy-invading apparatus — in a way that welcomes those users who don't wish to use more technical, involved means (such as µMatrix). EasyList, Peter Lowe's Adservers, EasyPrivacy and Malware domains are enabled by default when you install uBlock₀. Many more lists are readily available to block trackers, analytics, and more. Hosts files are also supported. Once you install uBlock₀, you may easily un-select any of the pre-selected filter lists if you think uBlock₀ blocks too much. For reference, Adblock Plus installs with only EasyList enabled by default.